When cabinetmaker John Thiesen gets his hands on a piece of wood, he lets the lumber tell its own story. “If I’m building a Mission-style vanity or turning a burl bowl on the lathe, I let the wood talk to me,” explained the master craftsman. His process depends on whom he’s working for. The carpenter also makes recommendations about what type of wood might work best in the construction. “The species of wood is part of the design element,” he explained. “I wouldn’t use poplar for a Mission piece when that type of furniture is usually made from white oak, mahogany or cherry. Thiesen has a keen eye when selecting species for particular projects. He studies the color, grain patterns, hardness and wood figures, which are determined by how the lumber is cut. With almost 40 years of experience, the self-taught artisan has mastered a number of skills, including veneer work, inlay, gold leaf, bent wood, hand turnings, upholstery, metal work, leaded glass and hand-cut dovetails. Samples of his commercial craftsmanship can be seen at Ulrich’s Tavern in Buffalo, Griffon Gastropub in East Aurora, the Liten Buffel Winery in Middleport and a pergola for a Holiday Inn in Geneva. The Southtowns artist also created a veneered 12-inch wooden pizza on a tabletop for Pizza Plant at Canalside. “I designed the pizza’s inlays to look like slices inset with pieces of pepperoni made from Brazilian rosewood,” he explained. One of his favorite creations is a reproduction of a slender chair originally designed in 1900 by Charles Rohlfs, a Buffalo furniture maker in the Arts and Crafts movement. That piece was made for the Milwaukee Art Museum and toured with an exhibition of Rohlfs’ works. Along with building furniture, he does kitchen and bath remodeling, fireplace mantels, pocket doors, and even restores wooden interiors on vintage cars. His repertoire also includes rustic-style lamps and light fixtures. 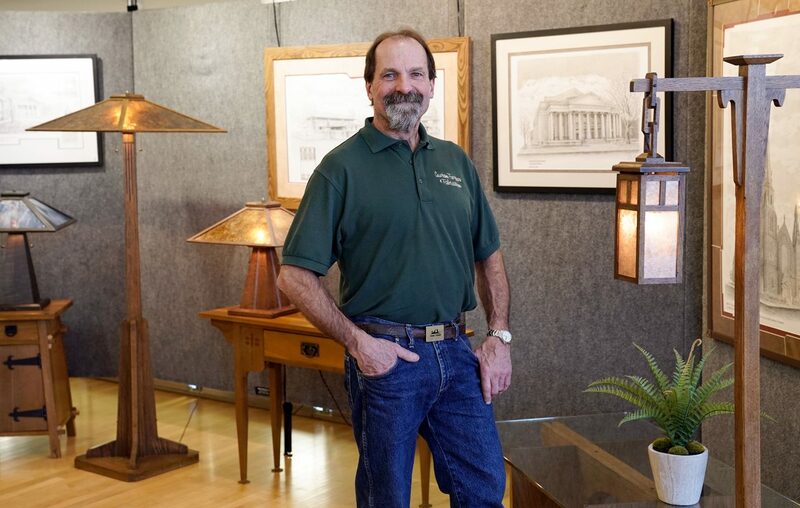 He has developed more than 30 designs for sconces, pendants and chandeliers for his Adirondack Craftsman Lighting online shop. The table or floor lamps are built from white oak, spalted maple or birch bark. Shade styles include stained glass, slag glass and amber or silver mica. With such versatile artistry, how did Thiesen’s career get started? “I began my woodworking business to pay the bills after a number of layoffs,” he recalled. His first construction project was a coffee table in 1977 made out of two-by-fours for his first apartment.